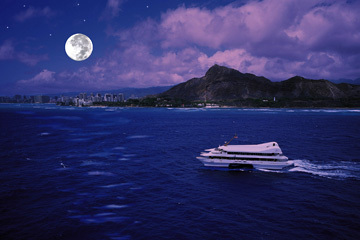 Imagine a 90-minute evening cruise off Waikiki. Add great live music, an ono pupu buffet, a sky studded with stars and the kind of big, beautiful moon that makes lovers swoon. Time: 8:30 to 10 p.m. daily through Aug. 20. Check-in is at 8 p.m. Cost: $58 for adults, $29 for children 2 through 12. Kamaaina rates are $35 and $20, respectively (mention a KSSK radio special for an additional $10 off the adult kamaaina rate through July 31). 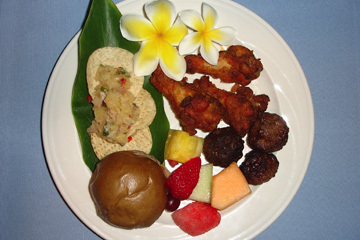 Price includes a pupu buffet; one drink (standard cocktail, juice or soft drink); coffee and tea; and round-trip transportation from Waikiki hotels. If you prefer to drive, parking is available at Aloha Tower Marketplace for an additional fee. Call: 973-1311. Reservations are required. Notes: Atlantis Navatek Cruises also offers a Sunset Dinner Cruise from 5:15 to 7:15 p.m. daily. It includes a Polynesian show and a choice of a casual buffet with chicken and mahimahi entrees or a formal steak and lobster dinner. Call for details. Then imagine enjoying all this for just about what you'd plunk down for two movie tickets and a couple of bags of popcorn. Through Aug. 20, Atlantis Navatek Cruises is offering a Moonlight Cruise aboard Navatek I, with kamaaina rates of $35 for adults and $20 for ages 2 through 12. (See the accompanying info box on how to get an additional discount.) No kidding. No restrictions. No strings attached. This is definitely one of the best entertainment deals around right now. My boyfriend and I took the cruise a week ago, and it reminded us how fun it is to see Hawaii through malihini eyes. First, a bit of background about Navatek I, which, in my opinion, is the coolest boat afloat in the islands. Its state-of-the-art double-hulled SWATH (Small Waterplane Area Twin Hull) technology employs pontoons that lift the base of the boat about 12 feet above the sea's surface. This enables Navatek I to provide a smoother ride than any other type of watercraft because passengers are transported over the waves instead of on them. Of the 40 or so SWATH vessels in service worldwide, Navatek I is the only one offering commercial cruises in Hawaii; most of the rest of the SWATH boats are being used by companies engaged in ocean research and by the military for submarine and sonar testing. 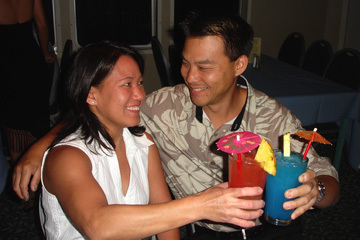 Pam Nakinishi and her boyfriend, David Uyeda, toast the evening on the Atlantis Navatek Cruise's Moonlight Cruise. Admittedly, there are no surprises on the Moonlight Cruise's pupu buffet: fresh fruit, teriyaki meatballs, kalua pork sandwiches on taro rolls, spicy chicken wings with ranch dressing, pineapple salsa and tortilla chips, and hot artichoke and Parmesan dip with lavosh. But the food is good, and there's plenty of it. Fill your plate. Then fill it again and again if you want. This is an all-you-can-eat affair, just the way we local folks like it. In a nutshell, the Moonlight Cruise is a cabaret at sea. A vocalist and guitarist provide nonstop music (Miss Hawaii 1998 Jennifer Hera and Kanoe Gibson, Miss Hawaii 2003 and the first runner-up in the Miss America pageant that year, are in the rotating lineup of singers). Their repertoire is diverse, ranging from ballads like "My Funny Valentine" to contemporary Hawaiian songs such as "Honolulu City Lights" to disco hits that'll spur you to hit the dance floor; think "On the Radio," "The Hustle" and "Funkytown." Former Miss Hawaii Jennifer Hera is one of several entertainers who seranade guests on the Navatek while they munch on all-you-can-eat pupus like taro rolls with kalua pork, fresh fruit, chicken wings, teriyaki meatballs and chips with pineapple salsa or artichoke dip. The night we were there, a boy no older than 10 was showing off dance moves so slick we agreed he would've easily made the final cut of "So You Think You Can Dance." Maitre d' Shenri-Ann Cabison also kicked off her shoes and performed a lovely hula to the Andy Cummings classic "Waikiki." And a young bride from Los Angeles took the mike to serenade her husband with a heartfelt rendition of "I Will Always Love You." If you're not already in love, there's a good chance you could be by the end of the cruise. We spent a good deal of time outside, marveling at the magical panorama of cityscape, sea and sky. Waikiki looked like a dreamland, aglitter with millions of lights. In the dark of night we could barely see the ocean below, but we could feel its energy as Navatek I skimmed its surface, as fleet and graceful as a gazelle. "The Moonlight Cruise is designed to promote a romantic atmosphere, albeit one in which children would not be out of place if parents wished to bring them along," said Ron Williams, president and CEO of Atlantis Adventures, which owns and operates Atlantis Navatek Cruises. "Being 140 feet in length, (Navatek 1's) not a huge vessel, yet she's sizable enough for guests to have privacy if they so choose," he says. "There are great spots for sightseeing on the two passenger levels, and there's also a rooftop observation deck on the stern." ALTHOUGH Hawaii residents love to swim, surf, snorkel and paddle canoes, they don't often go on boat excursions, Williams notes. "But you gain a whole new perspective of the ocean when you're on a boat," he says. "No matter how big the boat is, the sea is always bigger. You realize how vast and powerful nature is, and how small you truly are in the grand scheme of things." Aboard Navatek I, we understood the truth of that statement. There was no end to the ebony expanse of sea and sky. The lights of Waikiki mirrored the brilliance of the stars, many of them hundreds of light-years away. Cruising at night added an element of mystery, fantasy and wonder we had never experienced on daytime trips. We pretended Navatek I was our private yacht, carrying us far from everyday cares. We had no thoughts of deadlines, meetings and other responsibilities. No one else was on the deck, and the only sounds we heard were the hum of the boat's engines and the splash of waves against her bow. We sat there in contented silence, drinking in the scenery and fresh air and relishing the joy of living in the moment.